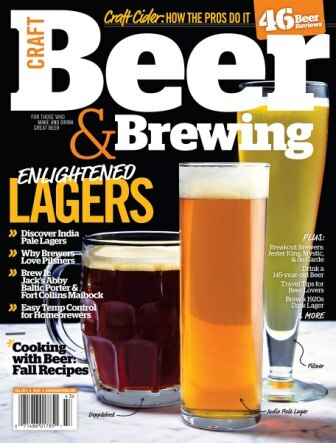 I’ve enjoyed reading the new Craft Beer and Brewing Magazine, just launched this Spring, which is packed with great articles for home brewers and craft beer enthusiasts. They were kind enough the offer the BeerSmith community a 20% discount on new subscriptions. To get the discount go to the subscription page and use the coupon code ‘beersmith’ when you check out – and they will take 20% off the price of your purchase. The second issue is 120 pages packed with great advice on brewing Saison’s, Belgian Beer, Blending beers, new hop varieties and much more. The third issue is just about to be published (shown right) and will focus on lagers, fall beer recipes and new brewing techniques. They were also kind enough to sign up as a sponsor for the BeerSmith podcast which I sincerely appreciate – so be sure to drop them a note and let them know you appreciate their sponsorship. Again, you can subscribe to the new magazine today by going to the subscription page and using the offer code ‘beersmith’ when you check out. Home Brewing with BeerSmith Book – Its Released! I am a paid user of Beersmith 3.0. Trying to use your discount code on Beer & Brewing Magazine to subscribe I get an “invalid code” when entering beersmith?? ?